Ryan used: Korg Gadget, Sunrizer, Audioshare, Soundscaper, Synthmaster Player, Samplr, Magellan, Mitosynth, Nave, Korg Module, Geoshred, Arturia iSEM, iSymphonic, CMP Grand Piano, Jordantron, Oriental Strings, Fugue Machine & Final Touch. For me, this concept album reminds me of many hours listening to great narratives like Jeff Wayne’s War of the Worlds and listening to Mike Oldfield, Tangerine Dream and Vangelis. Here’s my (spoiler free) track by track review / analysis. An epic electronic concept album telling the story of a scientist who puts himself in the position of testing living conditions on Mars in readiness to fully colonise the red planet. As the story progresses we learn about his wife Lydia and the strong bond they share and as his physical, emotional and mental wellbeing slowly collapses we begin to wonder what this mission was really all about. 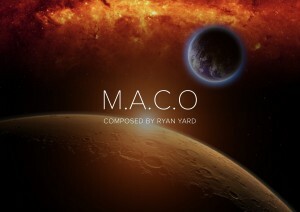 Follow his journey as he uncovers the secrets of M.A.C.O. A bleak audio soundscape supports the introductory narration with our hero informing us of his forthcoming journey to Mars. Although purposely not Richard Burton-esque, Jem Roberts’ portrayal is engaging, especially as the drama unfolds. Technological beeps and rhythmic pulses introduce a simple but toe tapping heartbeat groove. The track has an inevitable quality about it with a synth & piano melody and descending harmonic progression. A few stars whizz by as the hero is transported (in suspended animation we assume) to Mars. Think “Interstellar”! A roaring guitar solo adds a powerful emotional line over the groove. Pleasing synth solo strings add a mournful quality to this track. Narration; No one would have believed that… Some nice sound design and time-stretching here with effective panning to keep the sounds alive and immersive. This track kicks in just when you want it too and is very engaging, visual and fun. Since “The Martian” was released, we’ve had many visuals which might help to picture this album. We’re back in C minor which might be a home key on Mars and some of these tracks get a little stuck in orbit but this fanfare melody keeps the interest thanks to relative middle sections and a good bridge. Sirens lead to Day 21. This almost jazzy track (in A minor) has a lot of feel to it, relaxed with half time groove and high piano solo and it’s a welcome break from the synth grooves. My only suggestion for this is that the drums need a little more swing groove to match the piano solo. It’s at odds but perhaps that’s on purpose. Again, a great solo guitar part by Justin Towell compliments the track. This is completed by a powerful soaring synth lead coda. A powerful ending! A track of two halves: Like Bear McCreary’s Europa Report soundtrack, which mixes music and sound design to good effect, the texture of organ chords, piano solo, Mellotron flutes, Bom choirs, synth bass, orchestrations and a building rhythm add up to another great listening experience. The second section is darker with twisting melodies, a good groove and crunching guitars. Much is done here in 7 mins and I think this is one of my favourites, for its variety. FM synthesis, organs and strings conjures the Heart of Mars. Another collection of synth leads gives us a Jean Michel Jarre feel and toe tapping rhythms. Filtered memories of piano solos are suitably dark as the hero faces lonely imprisonment on the Red Planet. Impressive sound design indicates the hero’s mood and health. Subtle but dark. As things start to disintegrate, sound manipulation takes over, with dissonant string pads and a dark realisation. This track would work well in a horror movie – unnerving and relentless. Piano solos tend to do that! Simple panning breathes life into the bass pad. Another inevitable mood is created by dark minor progressions, pads and good sound design. An emotional ending is enhanced by combining elements from several previous tracks. I believe there were several endings to this album and I was so hoping for a hidden track after a few minutes of silence – but it was not to be! Find out what happens by buying the album. Rating 8/10 – A great listening experience that grows on you after the first listen as you’ll want to revisit it! This entry was posted in News, Reviews by Phil Toms. Bookmark the permalink.